In a difficult, uncertain time, it takes a person of great courage, such as the Dalai Lama, to give us hope. Regardless of the violence and cynicism we see on television and read about in the news, there is an argument to be made for basic human goodness. The number of people who spend their lives engaged in violence and dishonesty is tiny compared to the vast majority who would wish others only well. According to the Dalai Lama, our survival has depended and will contiue to depend on our basic goodness. 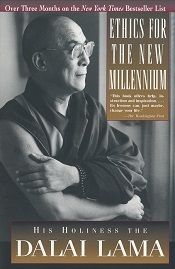 Ethics for the New Millennium presents a moral system based on universal rather than religious principles. Its ultimate goal is happiness for every individual, irrespective of religious belief. Though the Dalai Lama is himself a practicing Buddhist, his approach to life and the moral compass that guides him can lead each and every one of us - Muslim, Christian, Jew, Buddhist or atheist - to a happier, more fulfilling life. His Holiness the Dalai Lama is the spiritual and temporal leader of the Tibetan people. His tireless efforts on behalf of human rights and world peace have brought him international recognition. He is a recipient of the Wallenberg Award (conferred by the U.S. Congressional Human Rights Foundation), the Albert Schweitzer Award, and the Nobel Peace Prize.